I think the real reason Vans made the Finishing Kit is the big bubble canopy. If they had shipped the canopy with the fuselage kit, I’m sure mine would have been scratched or damaged some kind of way before I was ready to install it. It was a good idea to make it a separate kit and send it at the end. There are of course a few other things in the kit, like brakes, wheels, and a lot of fiberglass. Because I am not installing an O-360 engine, I will not be using the standard cowling or engine mount. Vans gave me a reduced price on the finishing kit for them. Of course they let me know that if I later wanted to order them separately, the price would be higher than the reduction. Apparently they give a kit discount on the price of parts when they lump it all together in the kit. In this section, we will be looking at installing the canopy in a RV-8. The techniques will still be useful to you if you are building something else. 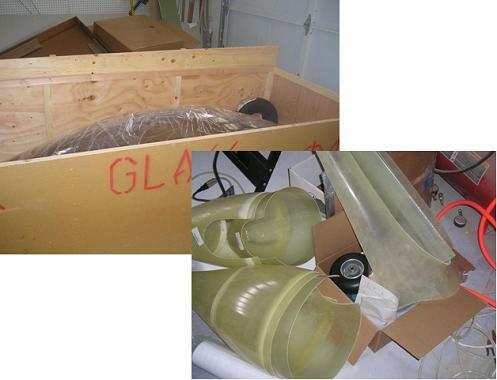 Working with Plexiglas and fiberglass doesn’t change with the type of aircraft it is going in. The ideas and tips can still be applied to your project. I divided the discussion into several pages to make it easier to navigate directly to the part you want to see. First you fit the canopy frame, then the plexiglas bubble, fit the skirt, and finally install the windshield and molding strip. I will also go through installing the axles and wheel, and discuss why I haven’t installed the wheel fairings yet. And here's how I worked the fiberglass cowling as I was finishing up the engine.